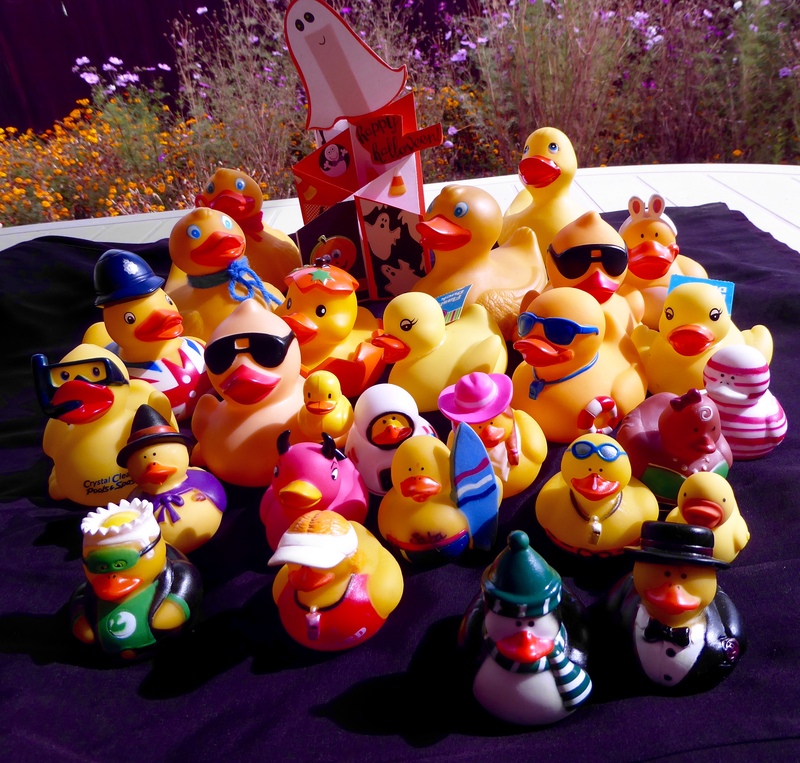 The Colorado Traveling Ducks and humans wish you all a very Happy Halloween. 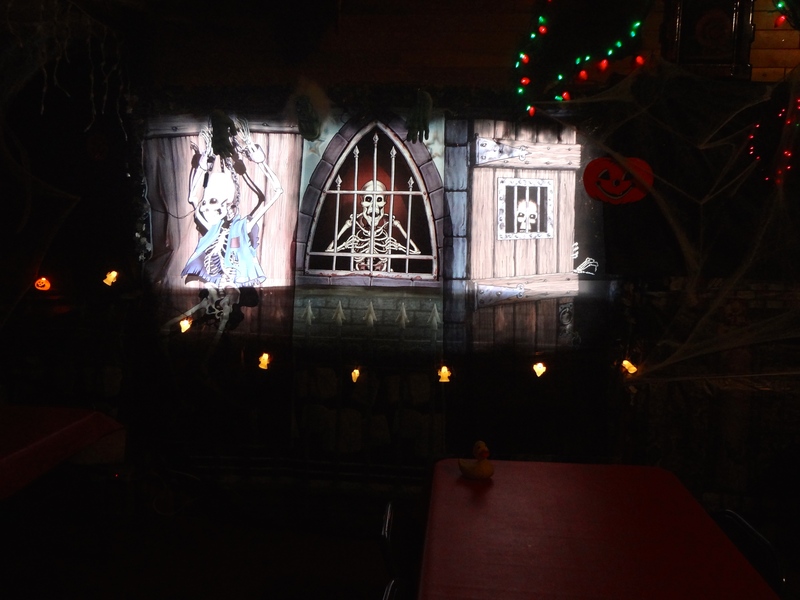 Wishing you all a safe and fun filled Halloween. I, Zeb the Duck, have news from Alaska. Eider Duck, my Alaska cousin, sent me these pictures. 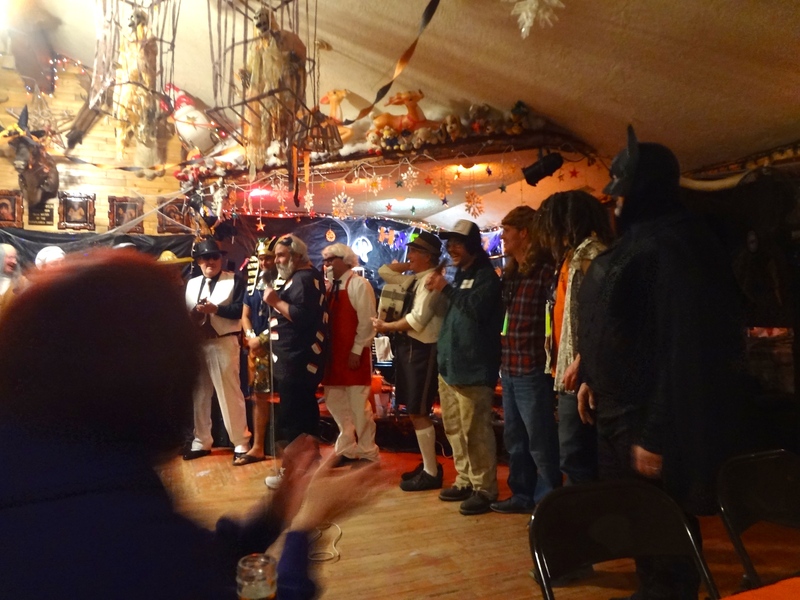 Eider and the humans go to Chatanika, Alaska, a town near Fairbanks, for the Halloween party. Eider said he had a lot of fun. Some people wear costumes. Eider says everybody has a lot of fun. 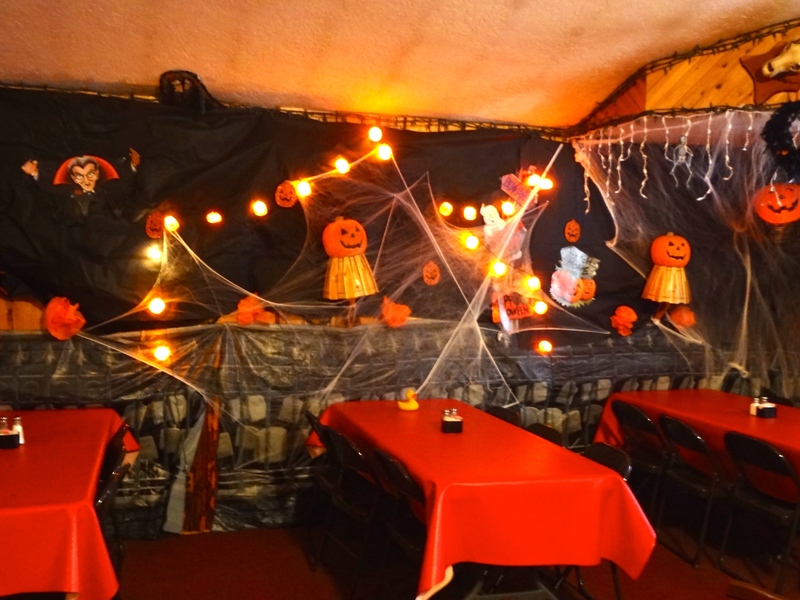 The bar and restaurant also has a few motel rooms, so many people stay for a night or two. People have a wonderful time in Chatanika. Eider, be careful. 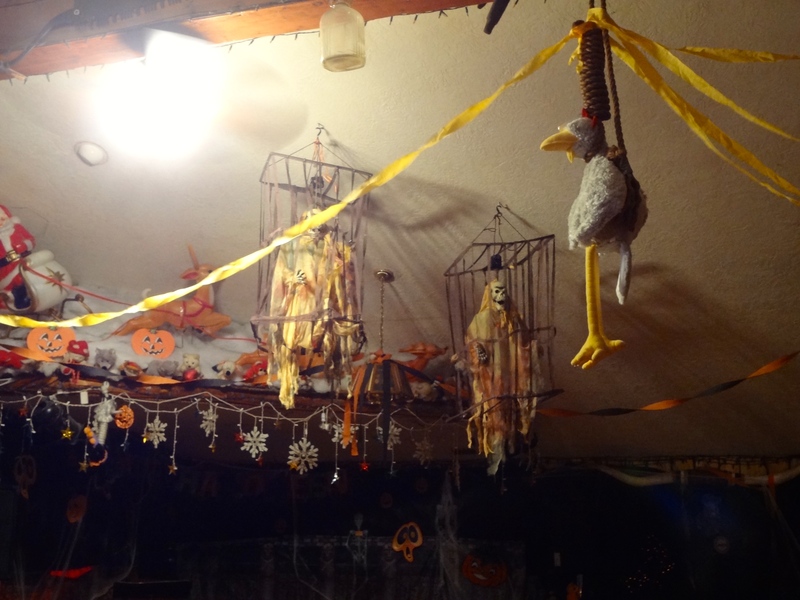 Is this party safe for feathered creatures?? Thanks for sending these photos, Eider. 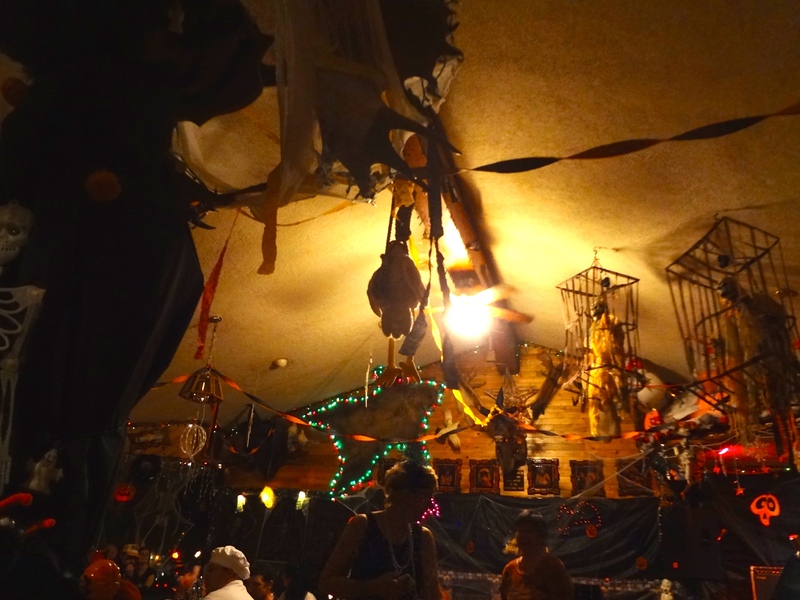 Looks like you had a crazy, but great, Halloween party. We all hope you have fun for Halloween. Remember, have fun and be safe. 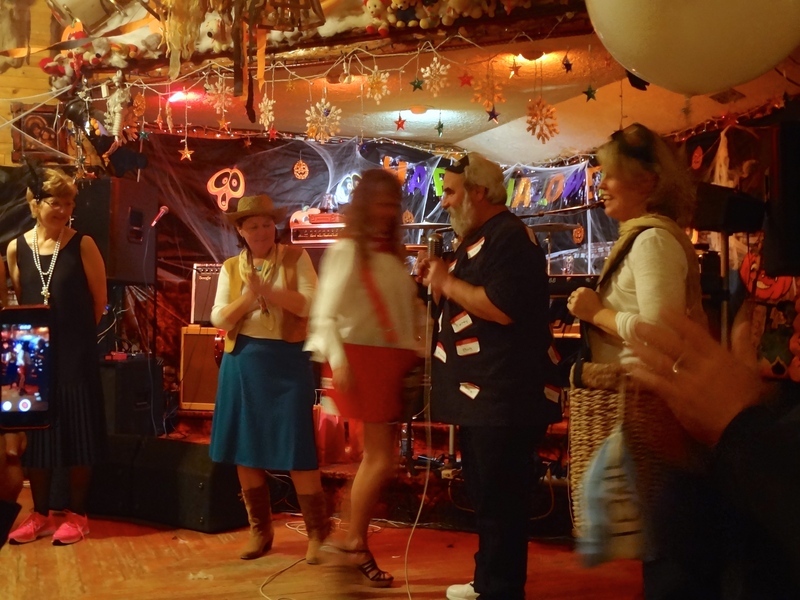 Halloween is a holiday for all ages to have a great time. We are walking past the rocks on Cable Beach now. We are sitting on a camel! Ours is sort of cute. The people are Red Sun Camel employees. 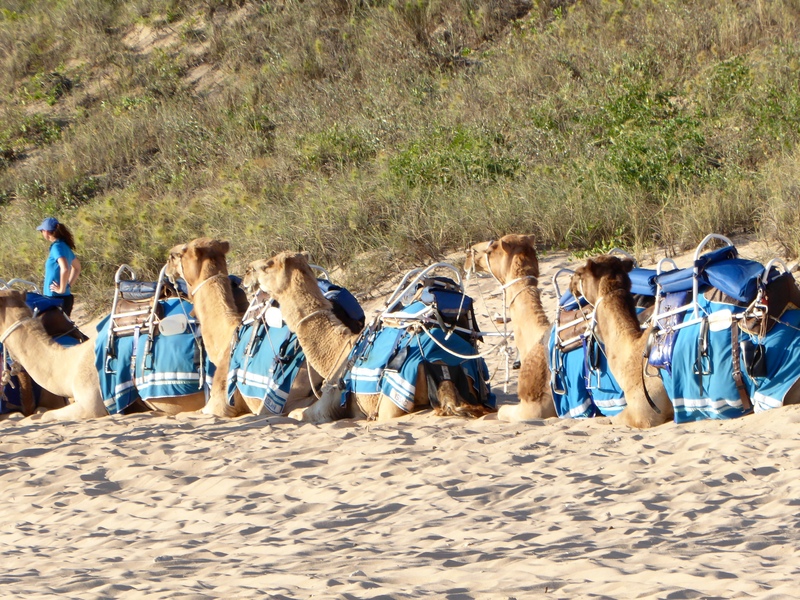 They will help us on the camel and walk with us to ensure we do not fall off the camel. 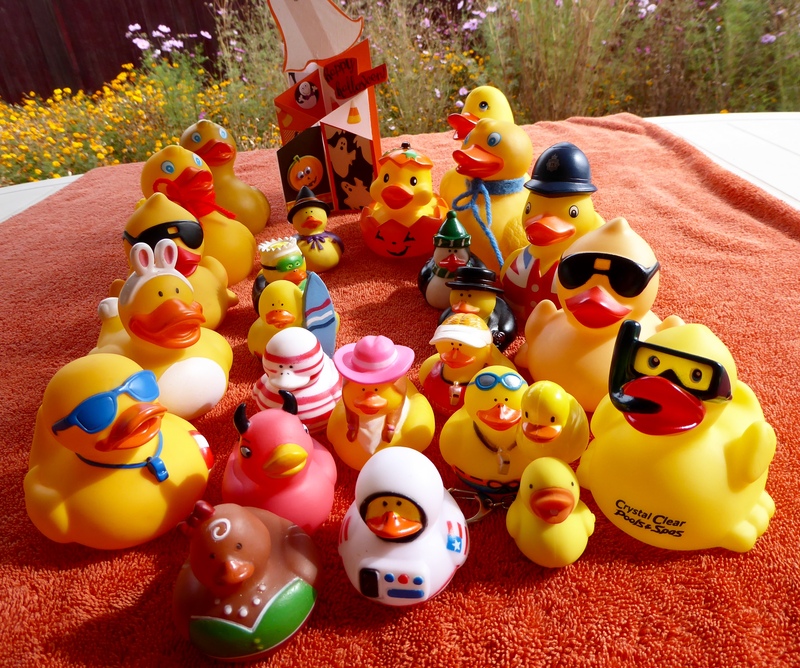 We ducks have to stay in our travel bags during the ride. 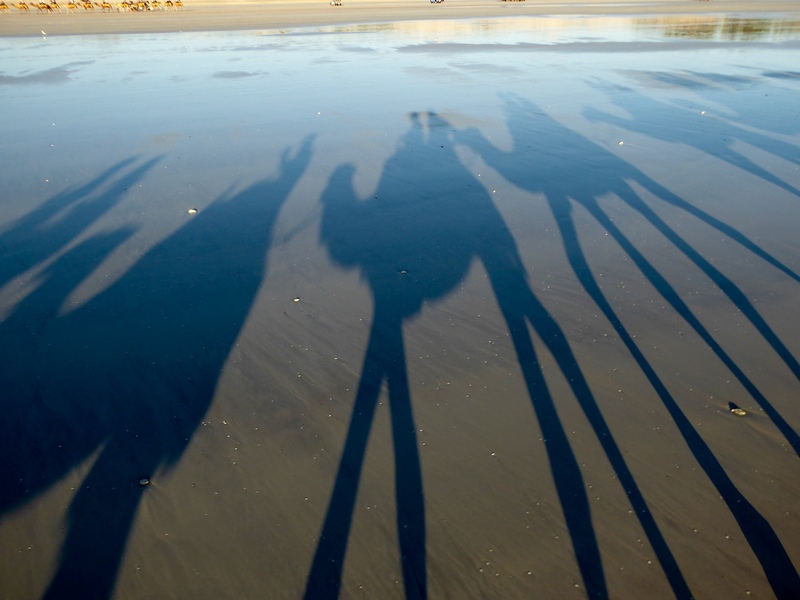 Humans think we may fall off the camels. We agree. The camels are connected and there are 18 camels in our train. We have 2 trains. 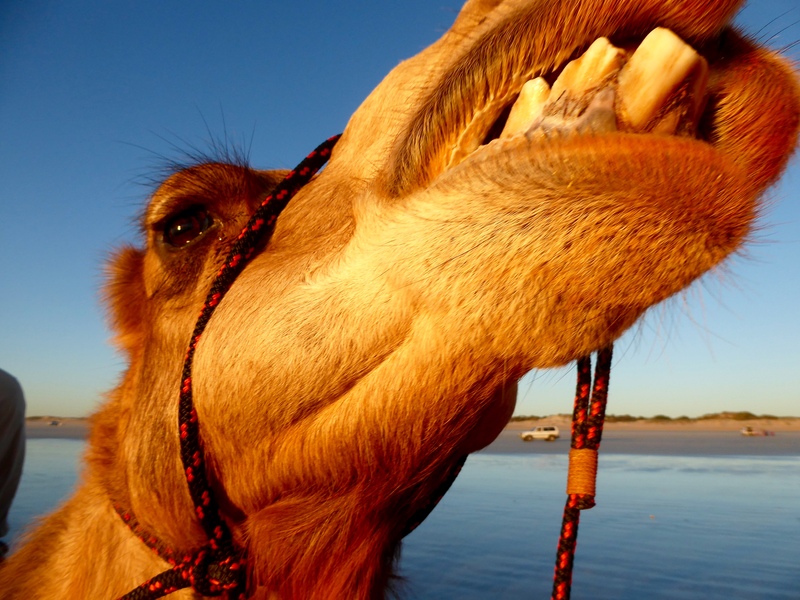 Anyone know a good camel dentist? 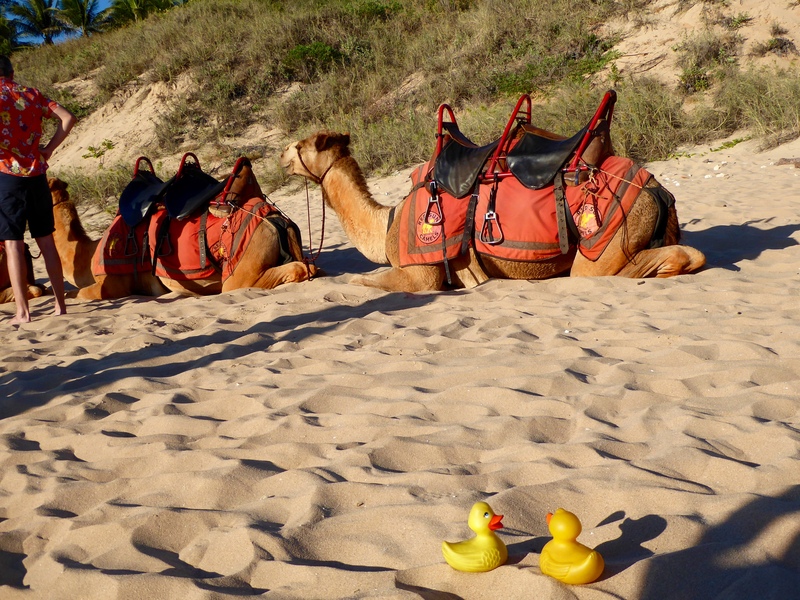 and the yellow camels. 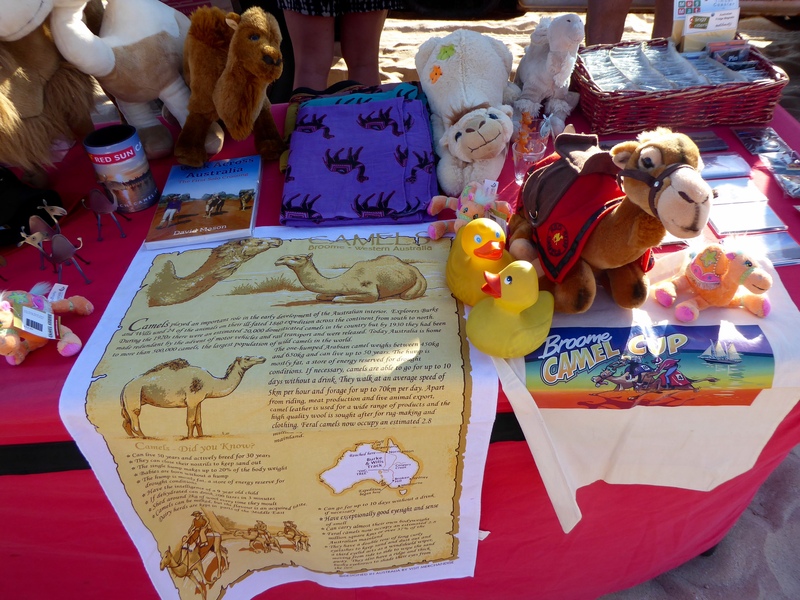 We really like the blankets on these yellow camels. 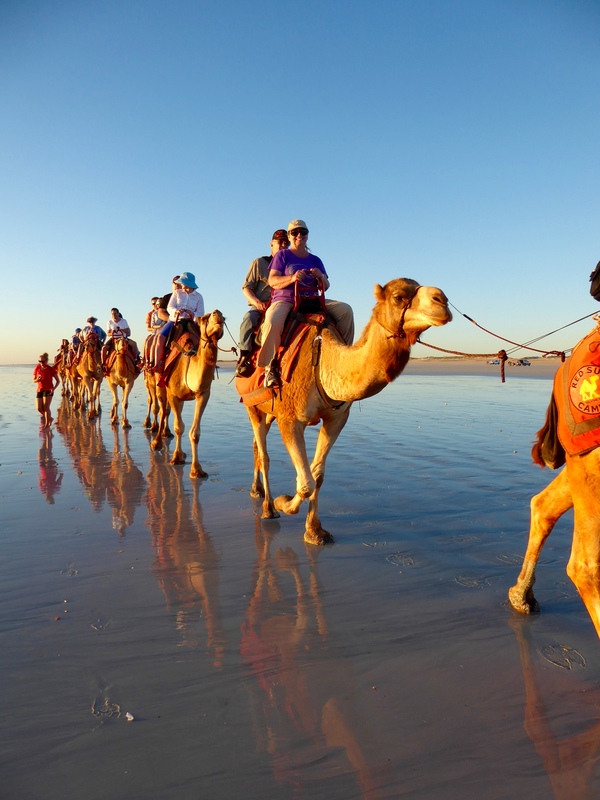 All the camel companies offer the same sunset ride. The sun is setting. 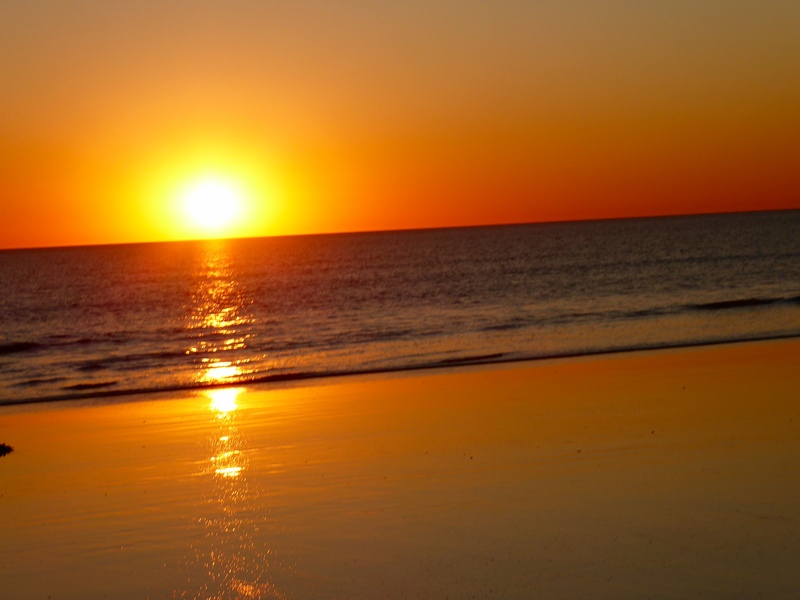 Another beautiful sunset on the Indian Ocean at Cable Beach, Western Australia. 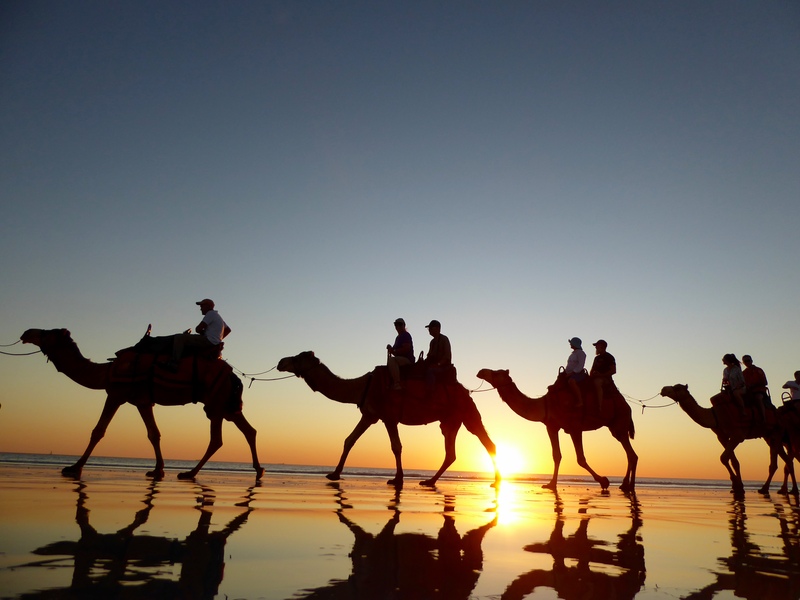 These camel rides at sunset on Cable Beach are very popular and now we know why. They are wonderful. We hope you can try one also. When you go, be sure to look at all the great souvenirs of your ride. 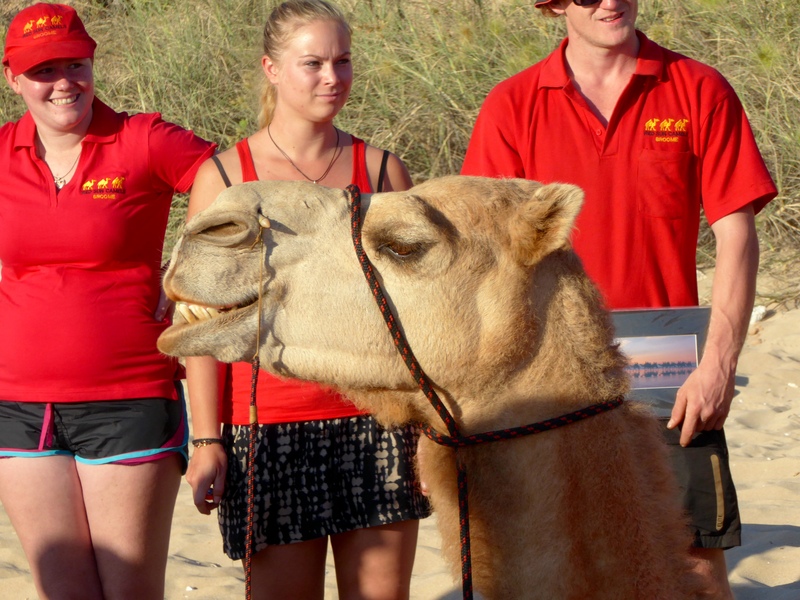 We just bought a professional photo of us on the camel, but they have so much to offer. 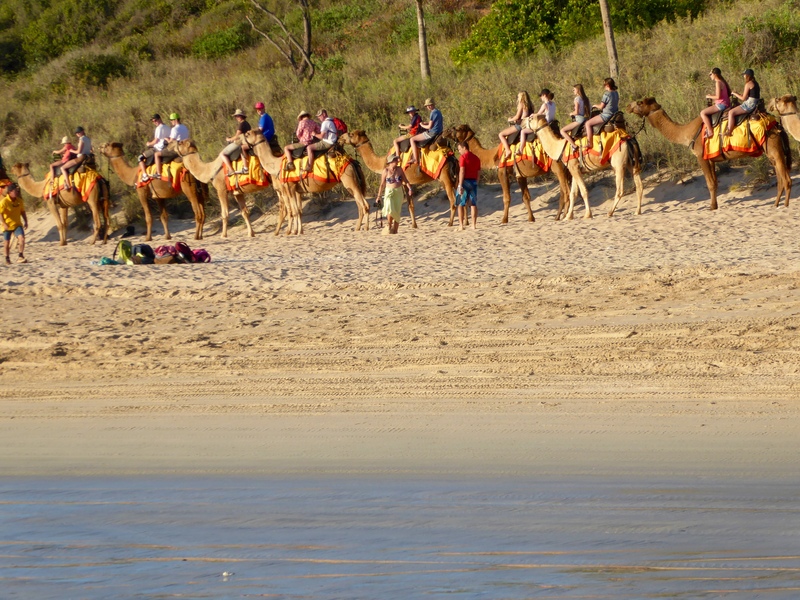 We love Cable Beach. 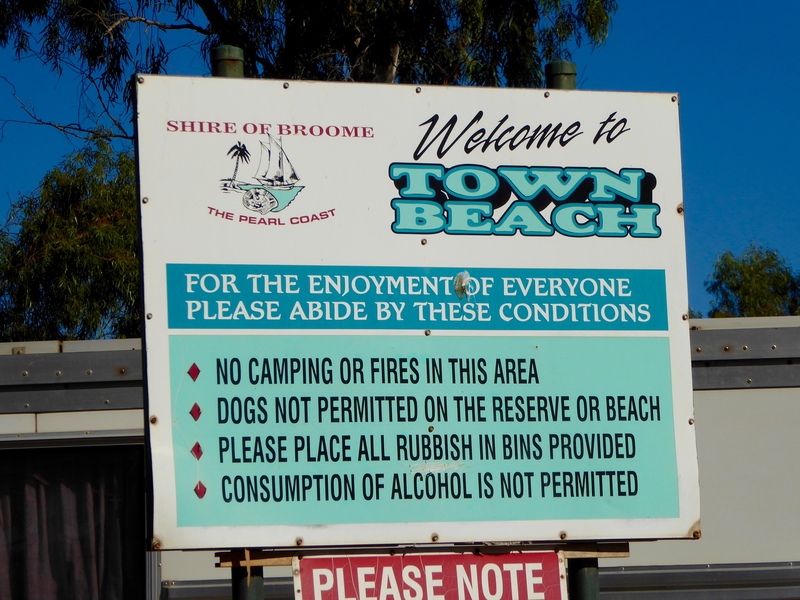 We love Broome. 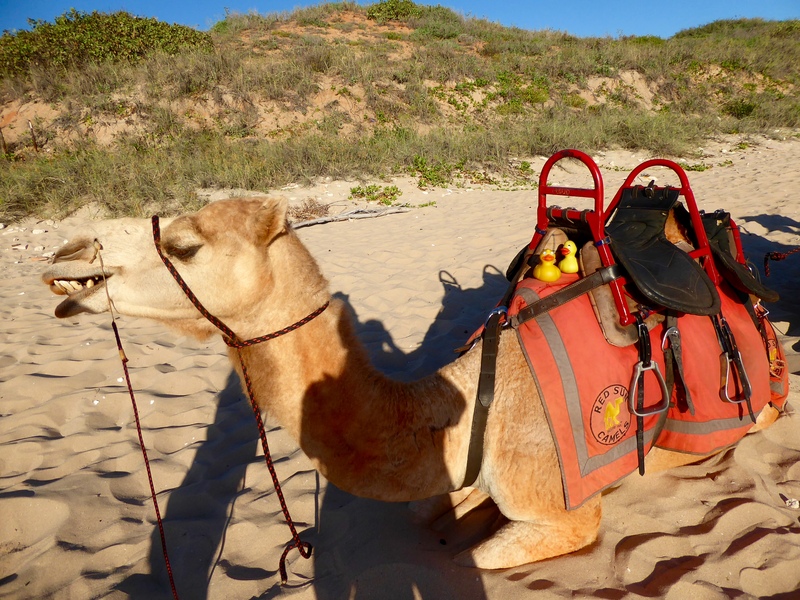 We love Western Australia. We love the sunsets. 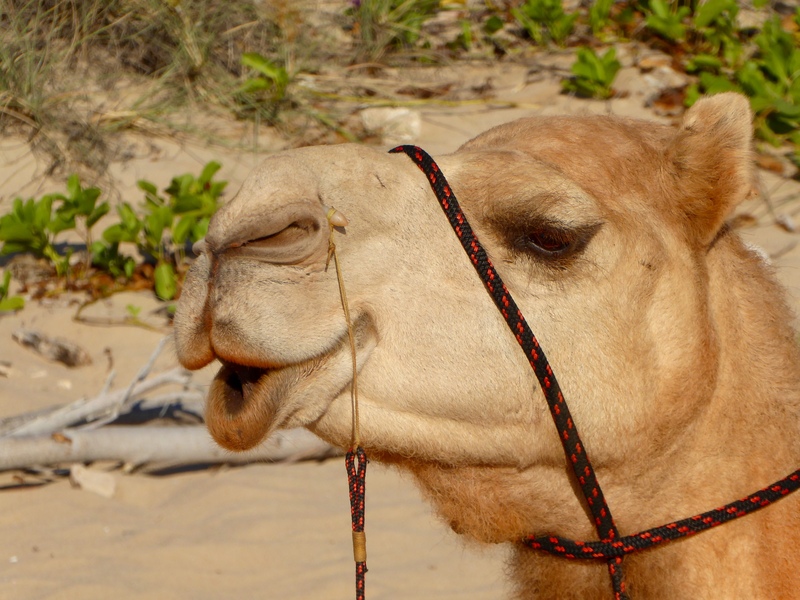 And, we even love our camel. 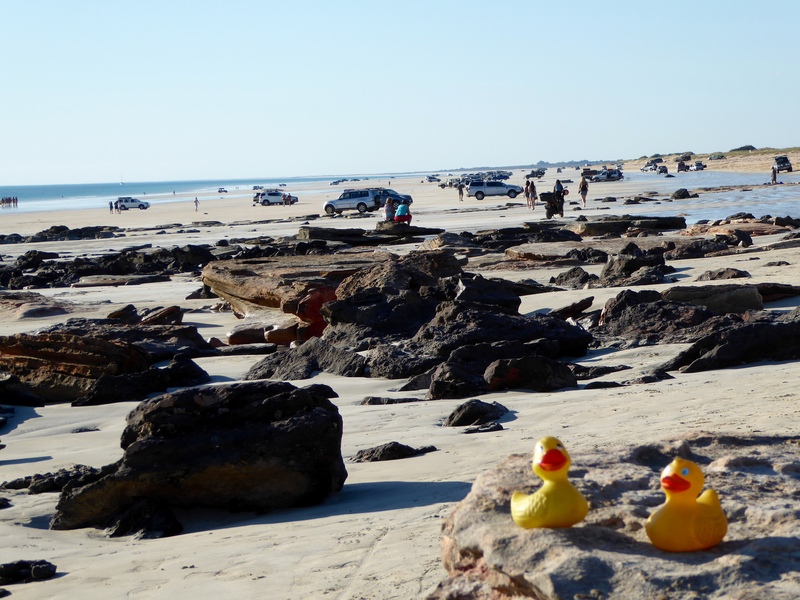 Walking from our Hotel Mercure Broome, Zeb and Eider Duck found Town Beach. 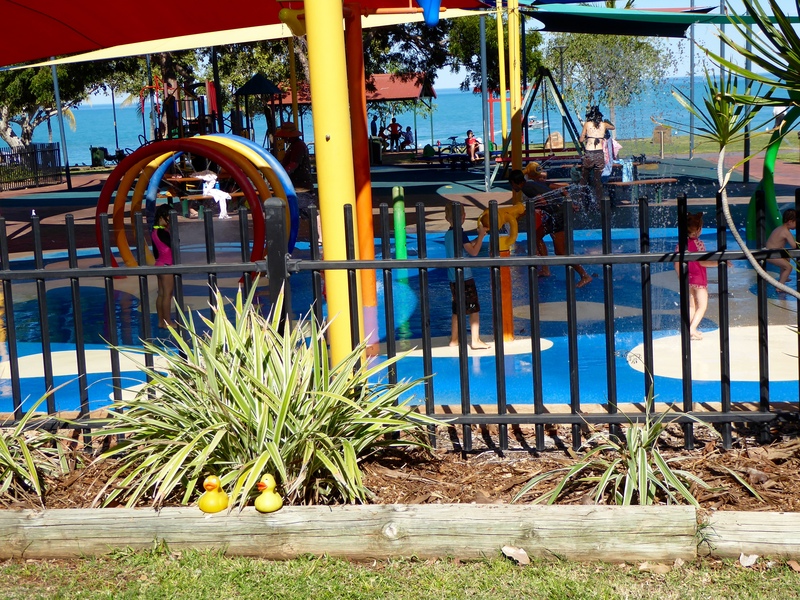 There is a great water area for kids there, even before we got to Roebuck Bay. Small humans and parents can get into the pools or play in the water fountains. They were having a great time. 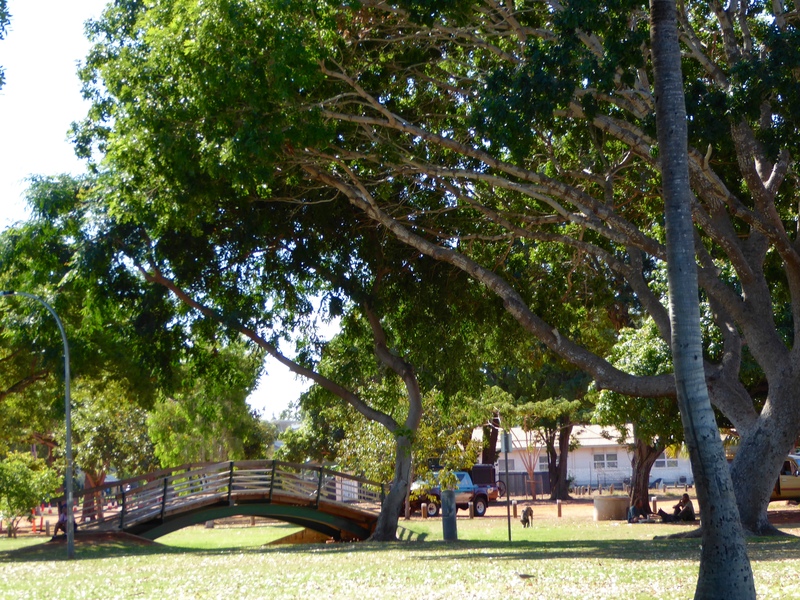 A large grassy park is also there. We loved this bridge. 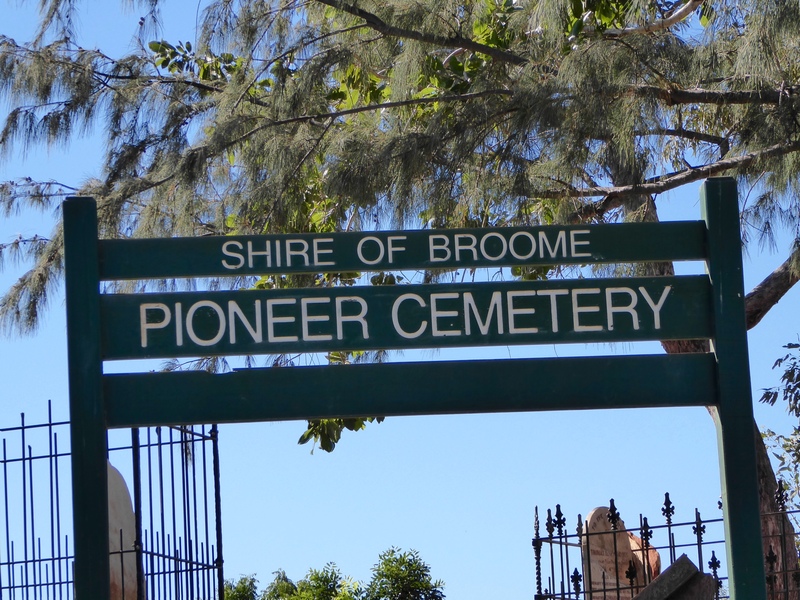 Pioneer Cemetery is also located at Town Beach. 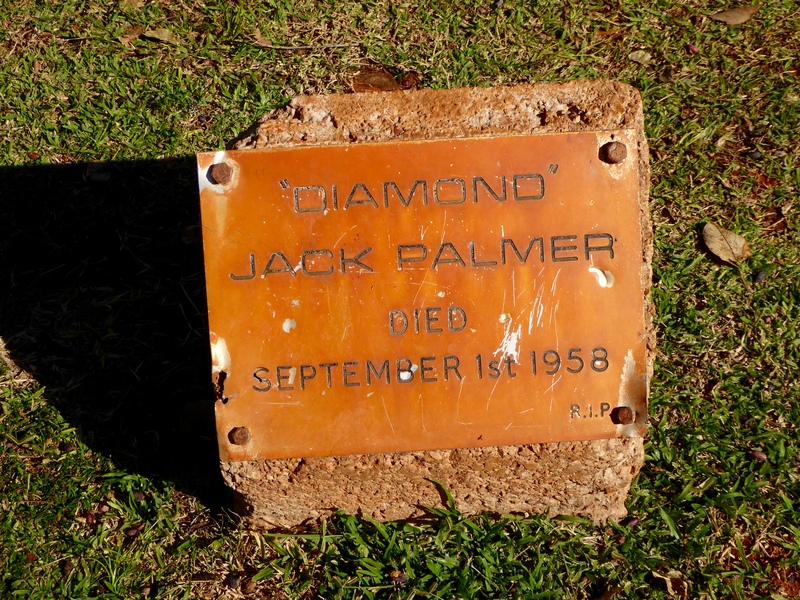 Here is the marker for Diamond Jack Palmer. What a great name! 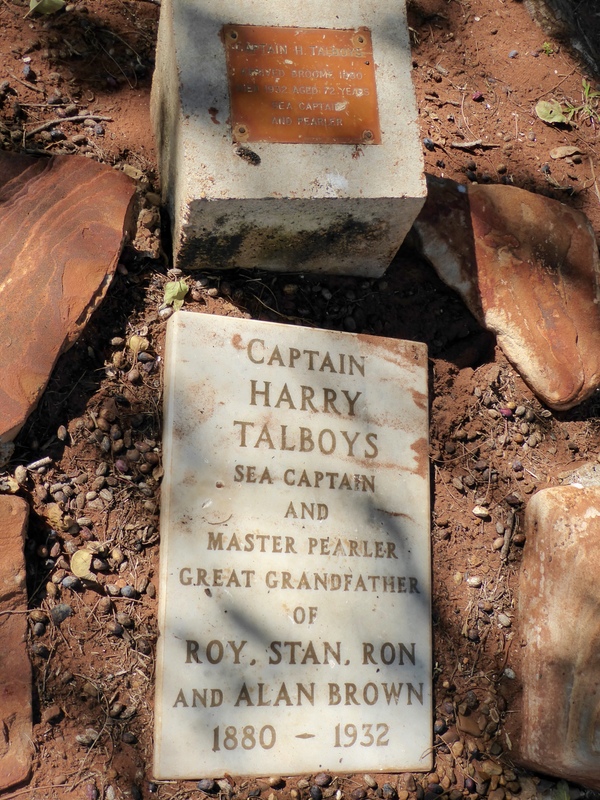 This marks the final resting place of Captain Harry Talboys. He was a Sea Captain and Master Pearler. 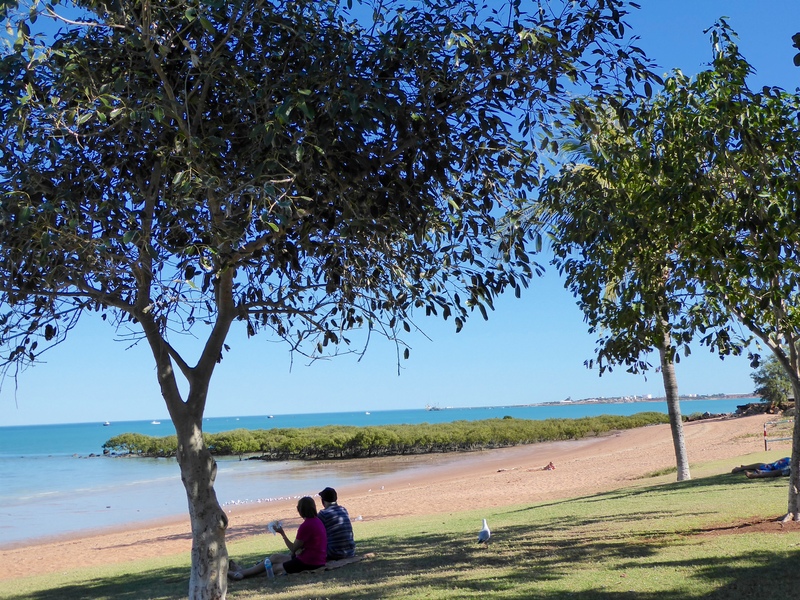 Broome was built by sea captains and the pearl industry. 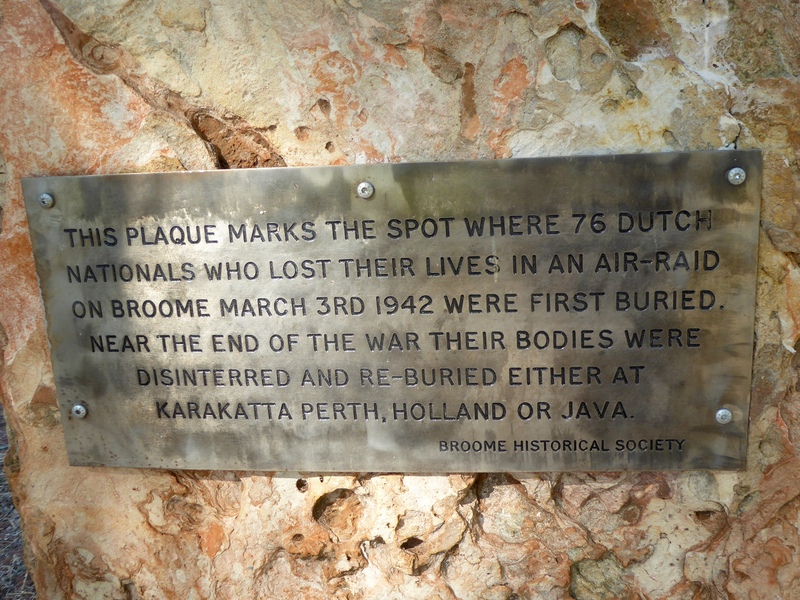 Not be forgotten, this is were the casualties from the first air raid on Broome were taken during World War II. Isn’t this a pretty beach? 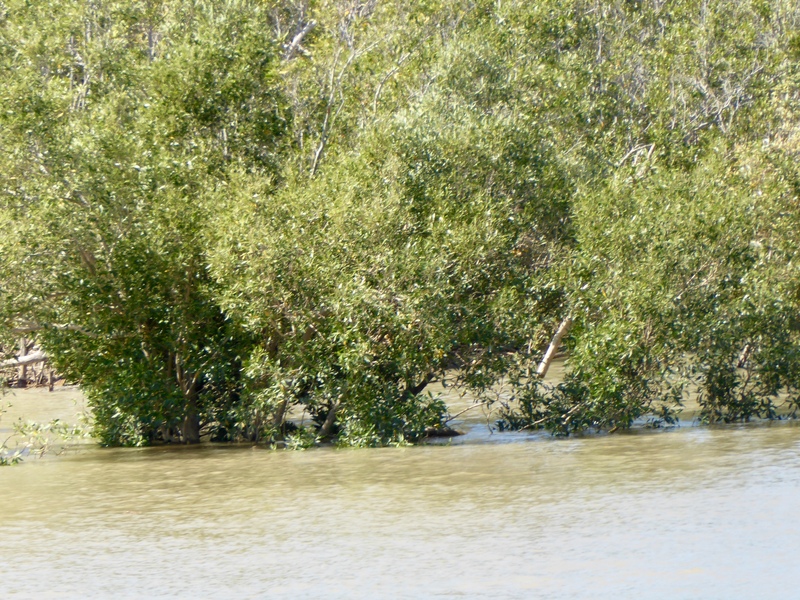 As you can see, the tide is pretty high now. 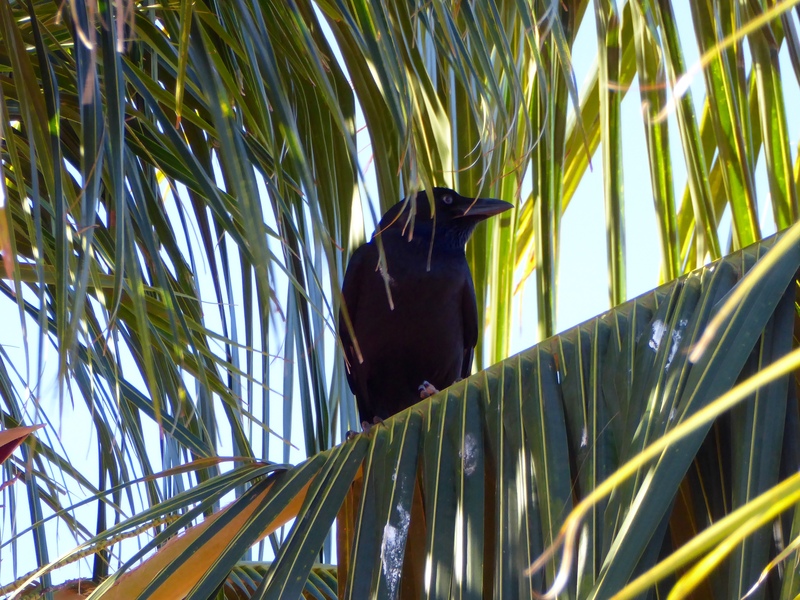 We liked this crow like bird, even if he was very noisy. Tonight is a full moon, so there is a special event at Town Beach. 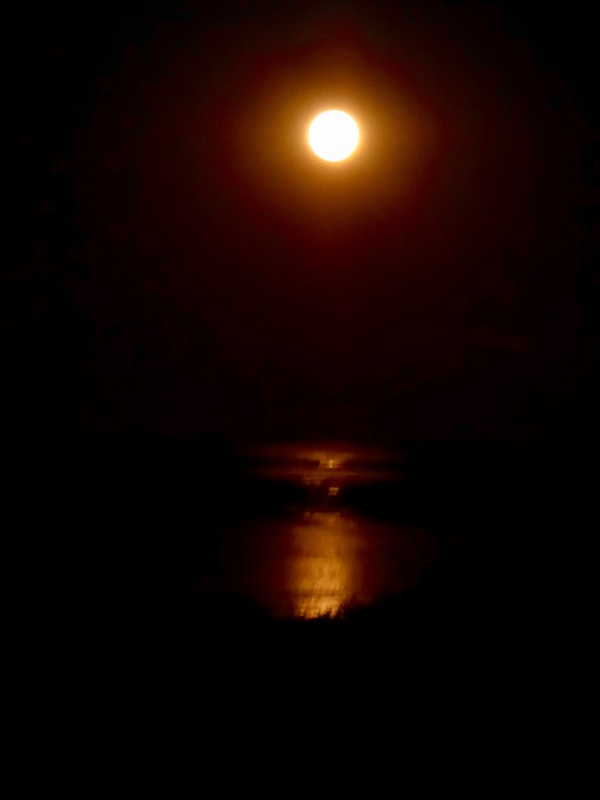 During some months of the year, when the moon is full and the tide is low, the light of the moon reflects on the mud flats and it looks like there is a stairway to the moon. 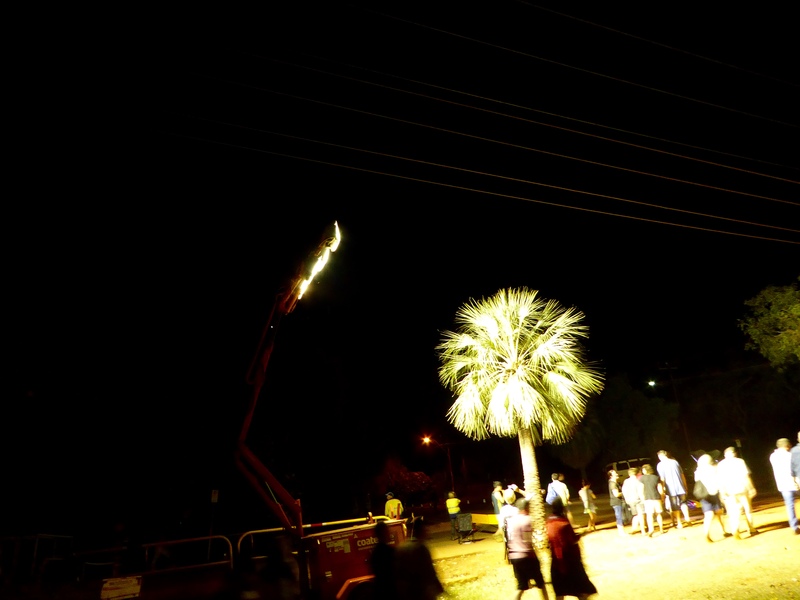 Tonight is Stairway to the Moon, and we are here, in Broome, Western Australia. The Stairway to the Moon is best viewed from Town Beach. We liked the Stairway to the Moon and there was a festival there also. It was a lot of fun with great food. At the festival we visited many craft booths. The food booths were so tempting. 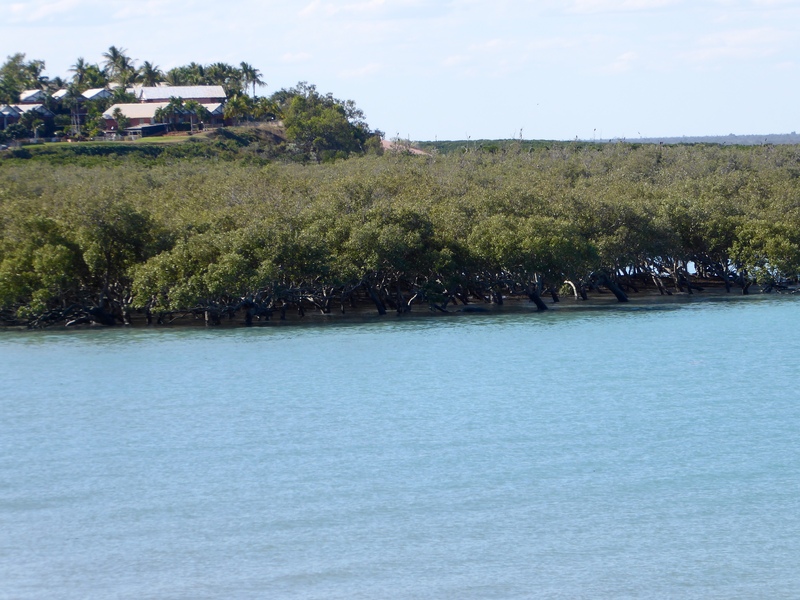 The closest neighbors to Broome, Australia are Indonesia, New Guinea, Malaysia, Singapore and other islands. As result the craft booths had so many items we don’t usually see at home. 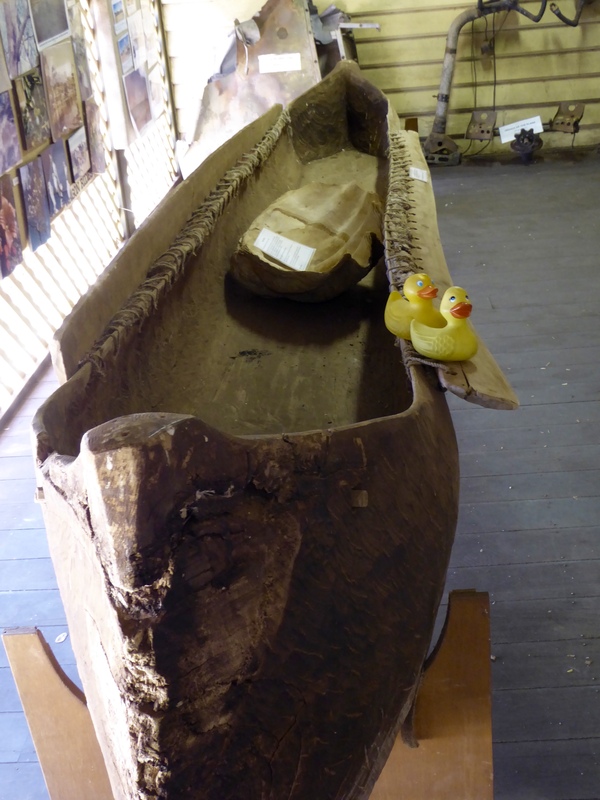 Incredible wood carvings and so much more. The aromas from the food booths were truly making us salivate. 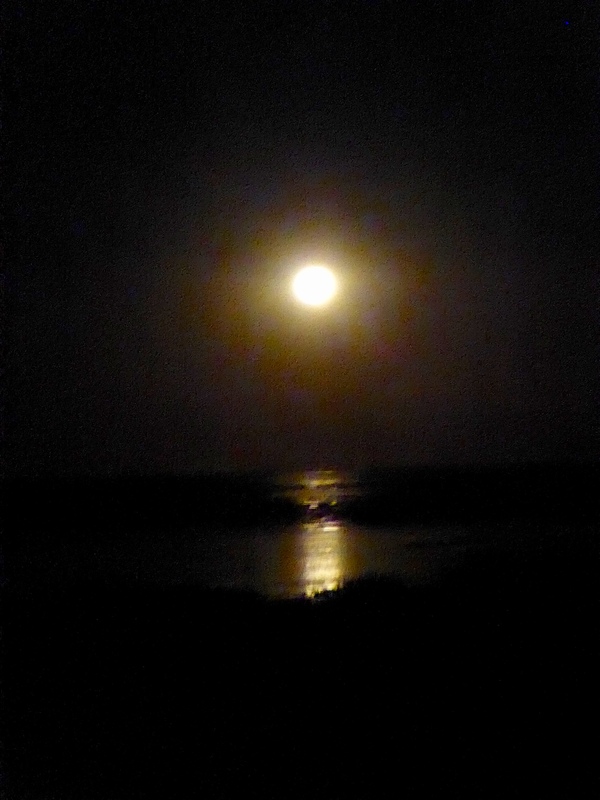 A warm tropical evening, full moon, new and appealing fragrances and a Stairway to the Moon. . . This truly was a night to remember. It was too dark for photos. Just look how dark this tropical sky is tonight. 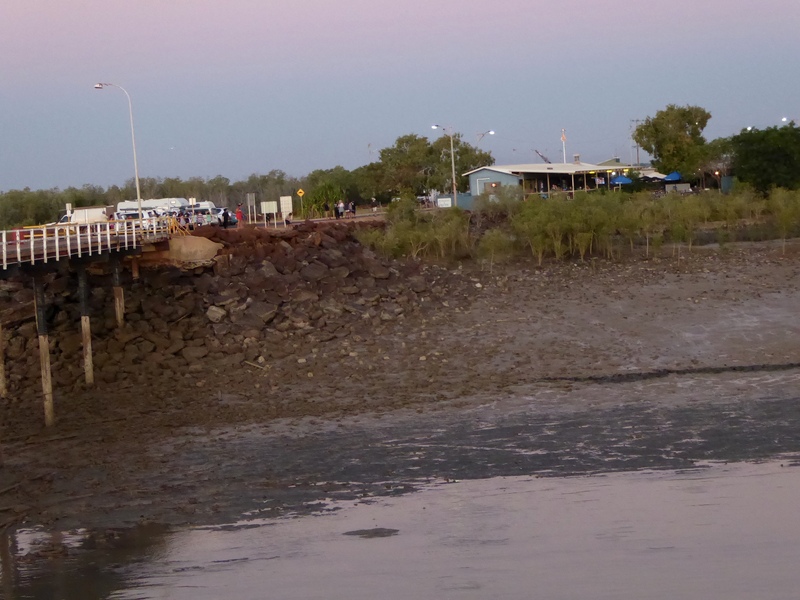 We hope you are in Broome, or Western Australia, sometime to see the Stairway to the Moon. We, Zeb and Soapy Smith Duck, stand at the foot of the world’s largest talking loon. 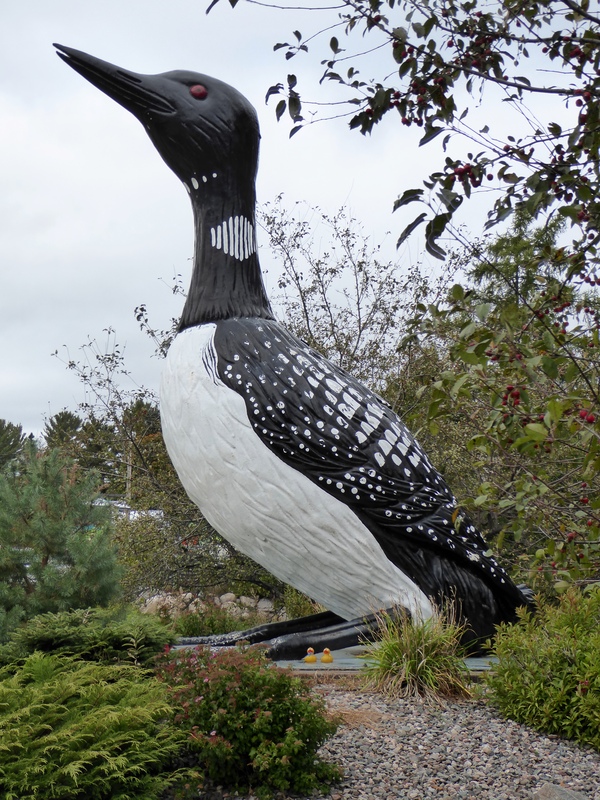 This loon is 16 feet tall and stands in Mercer, Wisconsin. You have to see him! We drove across a bridge from Duluth, Minnesota to Superior, Wisconsin. 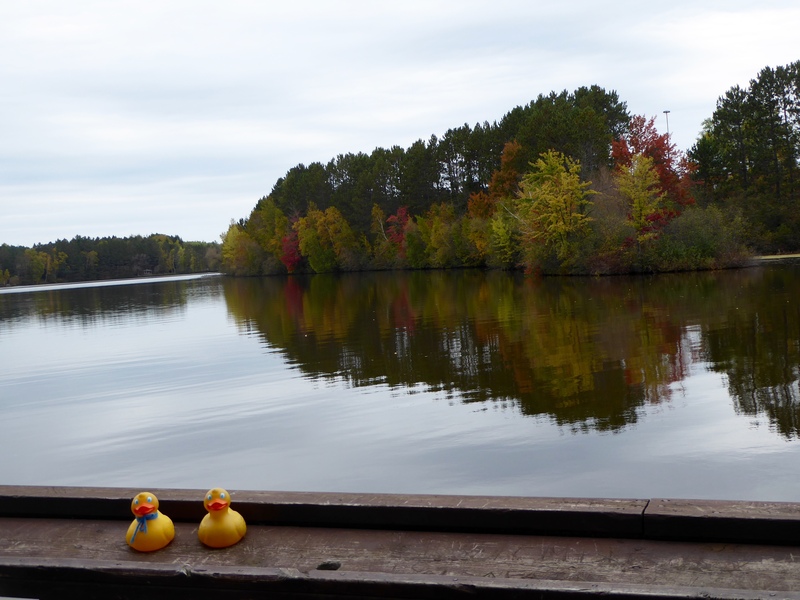 When mom and our cousin, Eider Duck’s dad were kids, they used to vacation in Northern Wisconsin. We are crossing northern Wisconsin, heading toward Michigan’s Upper Peninsula. Just before Michigan, we took highway 51 south. We passed by, and drove on, so many quiet roads like this one. Here you can see that the leaves were turning colors for autumn, but they were not yet at their peak color. 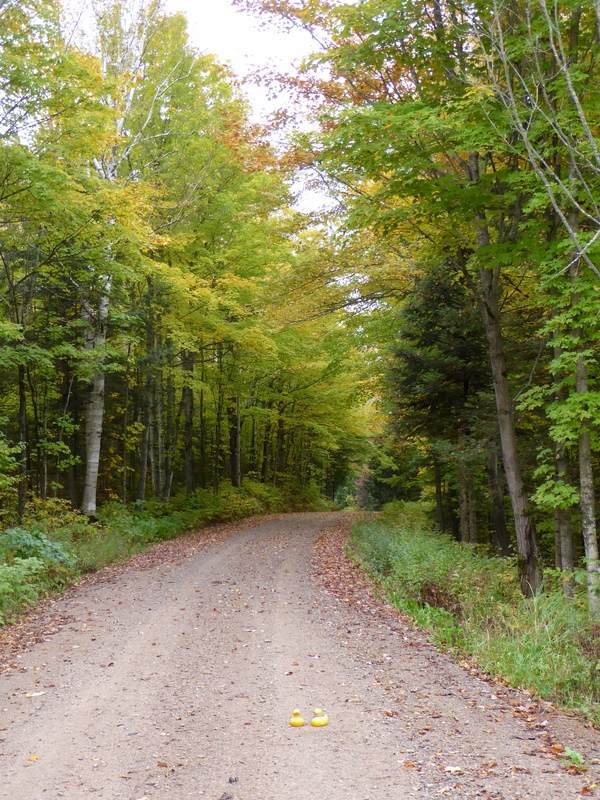 A little north of Tomahawk, we turned on a small road that partially circled a calm lake. 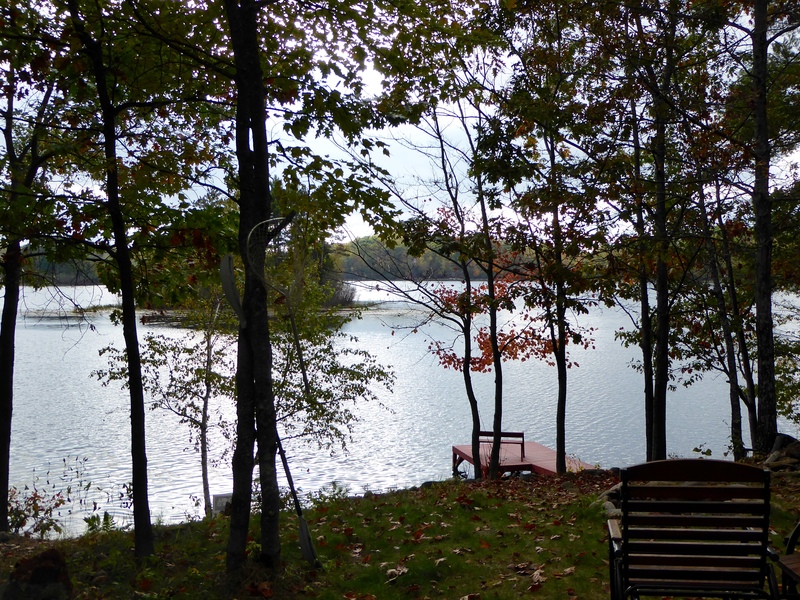 This is the lake mom and her brother visited as kids. Isn’t it a beautiful place? Was great for kids to learn to swim and handle small boats. Here we are sitting on logs. 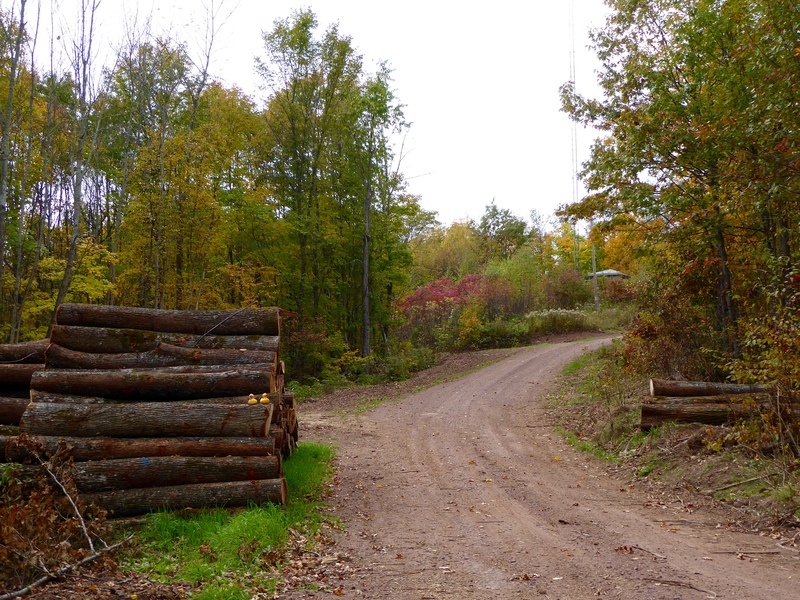 This is what you would imagine for the forests in the north woods area. Wisconsin is not all woods though. 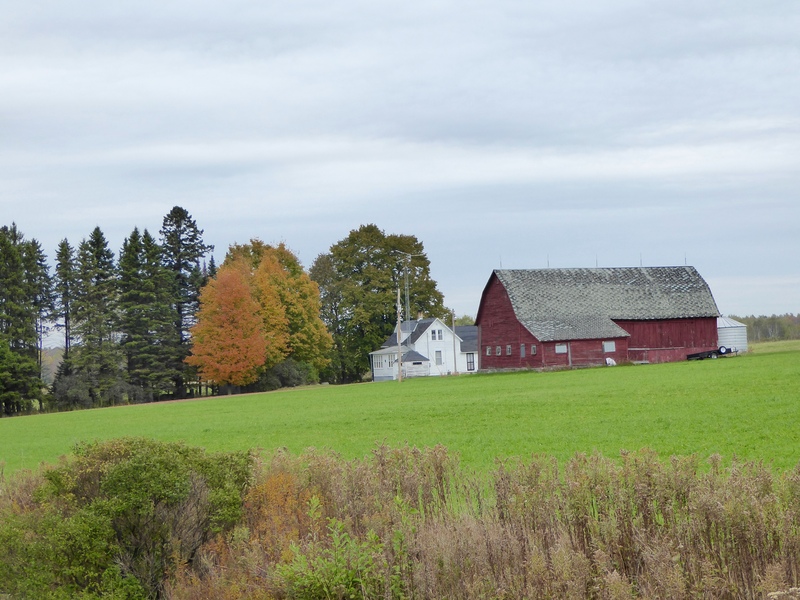 This is a Wisconsin farm. Remember, Wisconsin is the Dairy State. We saw so many scenes like this. The tall trees and a lake. We love the reflection of the trees on the still water of the lakes. 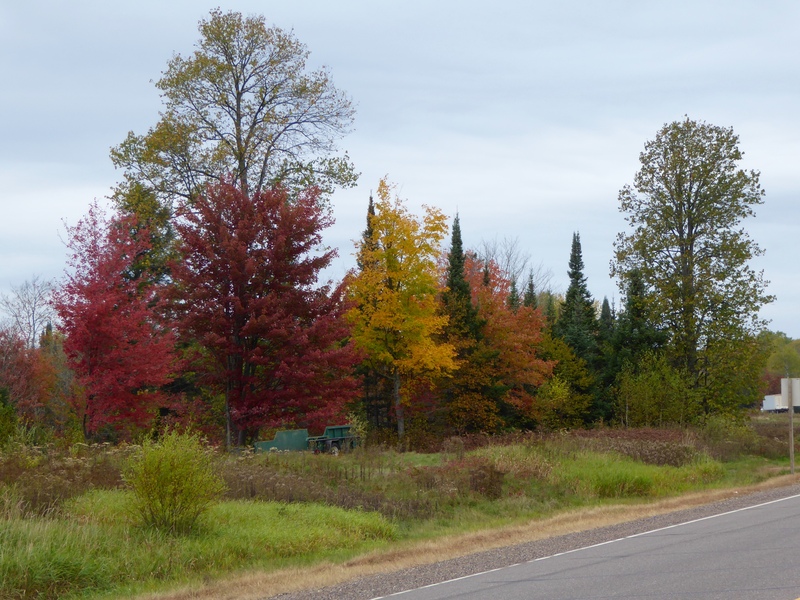 Another typical scene driving down most roads in Northern Wisconsin. You can see the leaves have started to change colors. 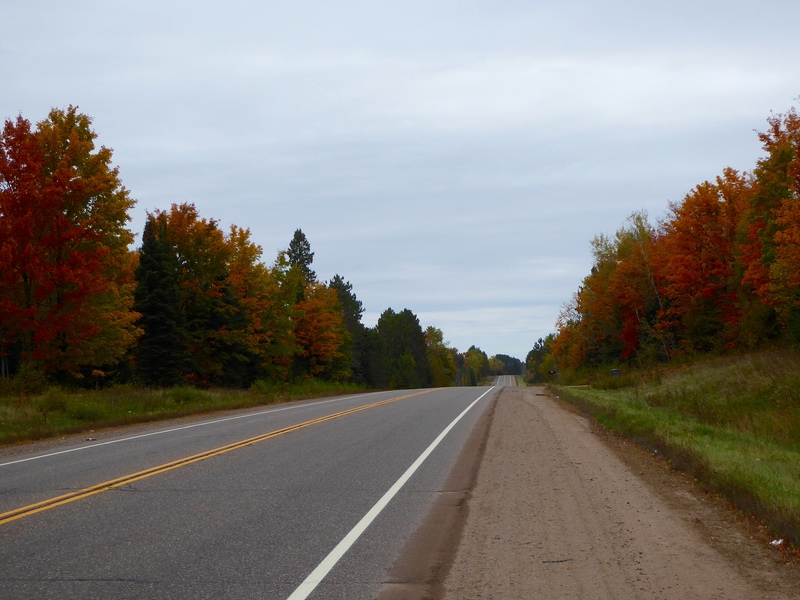 On this quick tour of Wisconsin, we drove from Superior east to highway 51 near the Upper Peninsula of Michigan. Then south to Tomahawk. 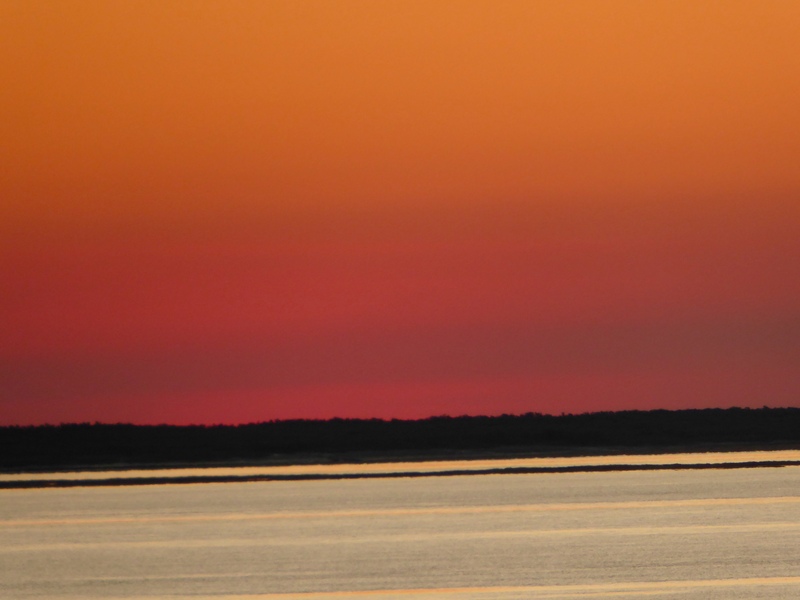 A little west and drove on highway 13 back to Ashland, located on Lake Superior. 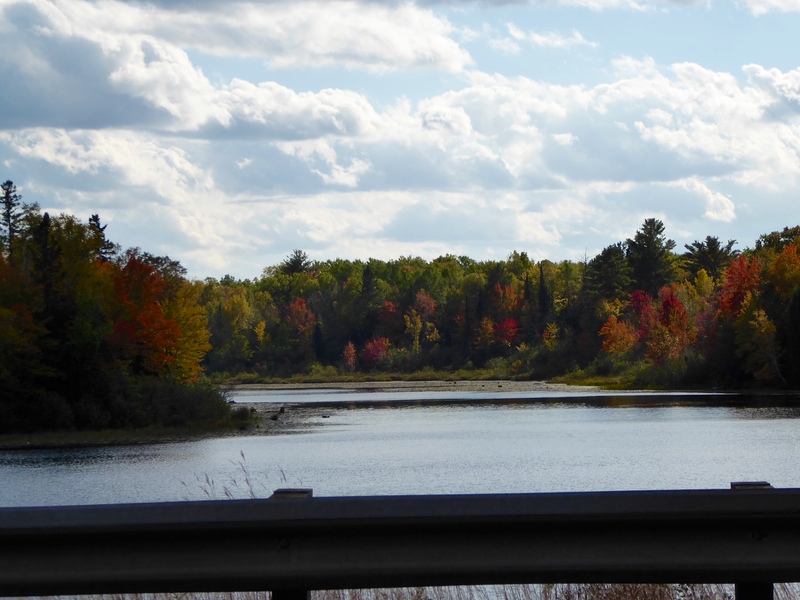 We loved our drive through Northern Wisconsin. We hope you like it also. 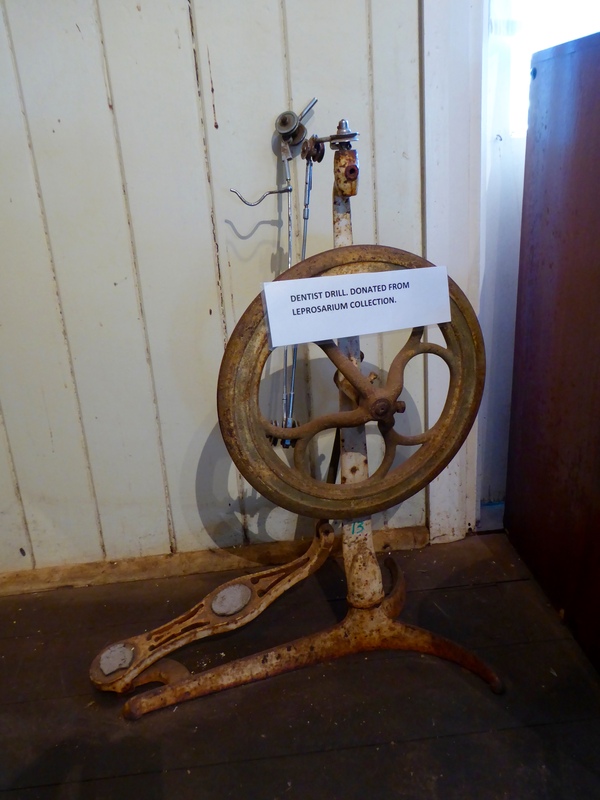 In Derby we visited the Wharfinger’s House Museum. The Wharfinger is the person who owns or has control of the Wharf. 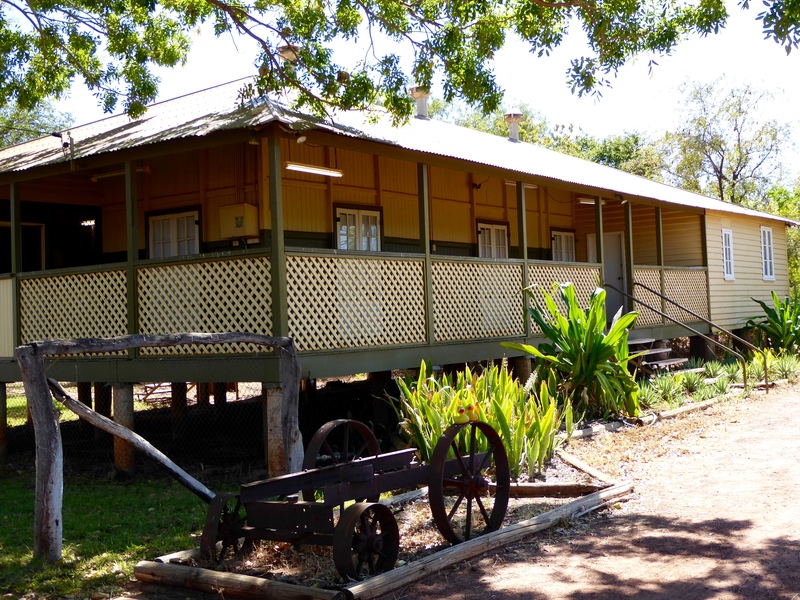 This is an example of prefabricated wooden housing of the 1920s and 1930s. There are three sections of this museum: shipping, communication and aviation. This canoe from Sunday Island is great. Makes us want to go for a canoe ride. Oh no! This is a dentist’s drill? Makes the Colorado Traveling Ducks glad they do not have people teeth. Walking around Derby we found the Old Derby Gaol. The Old Derby Gaol is located next to the current police station. 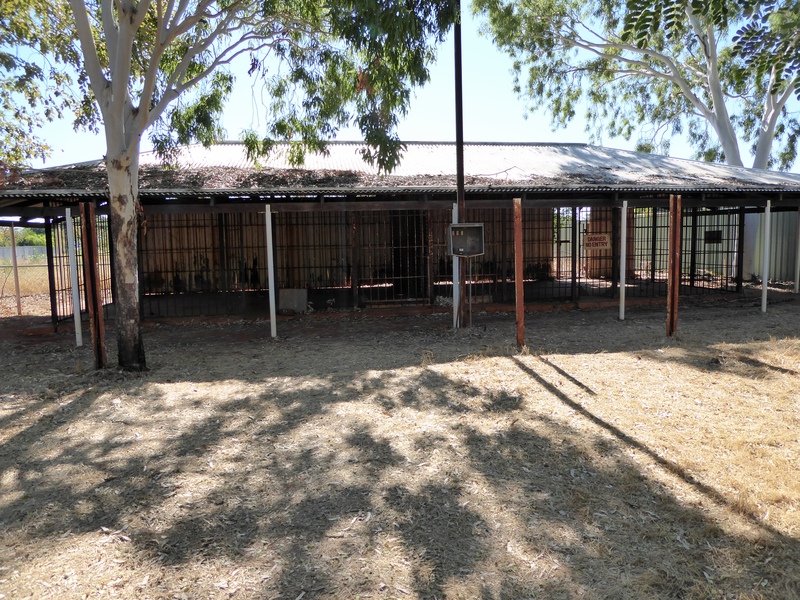 This original prison, or gaol, was often overcrowded and without proper sanitation facilities. 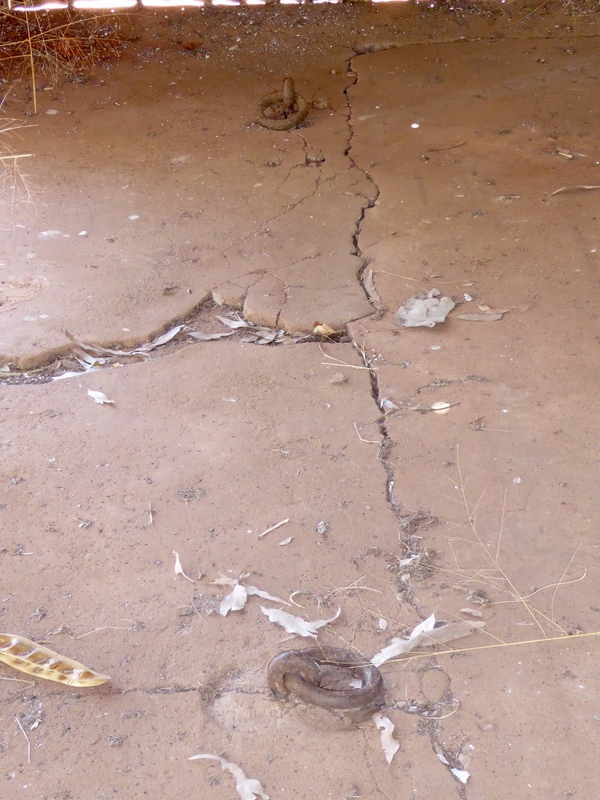 Many prisoners were chained to the floor to prevent movement and escape. 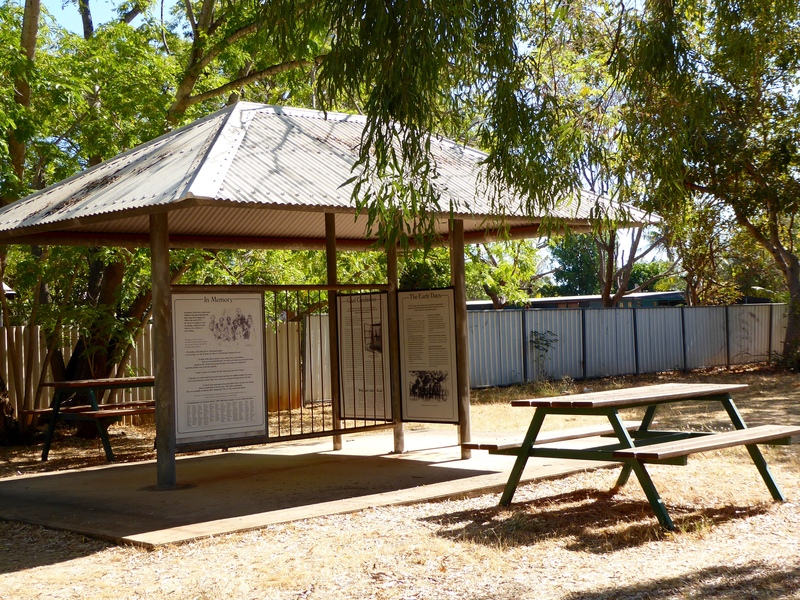 The signs in this area say that most of the prisoners were aboriginals. 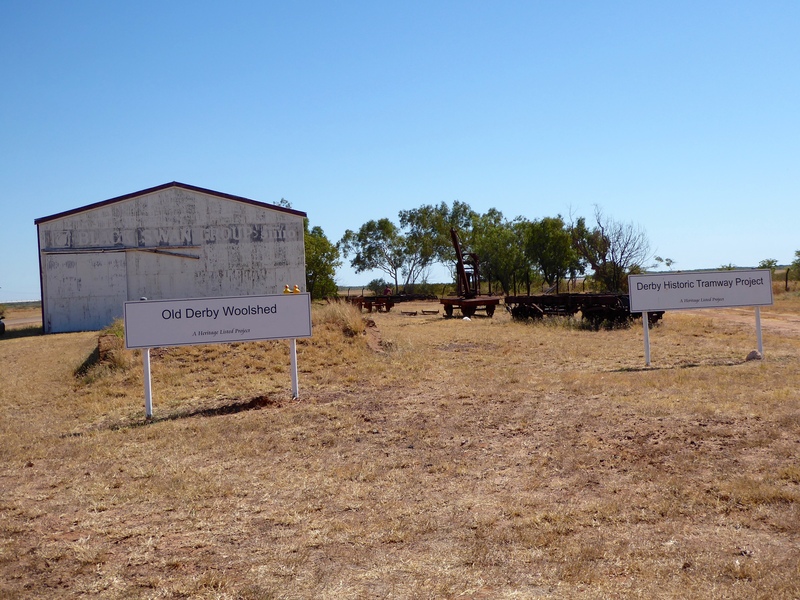 Near the wharf we saw the Old Derby Woolshed and the Derby Historic Tramway Project. 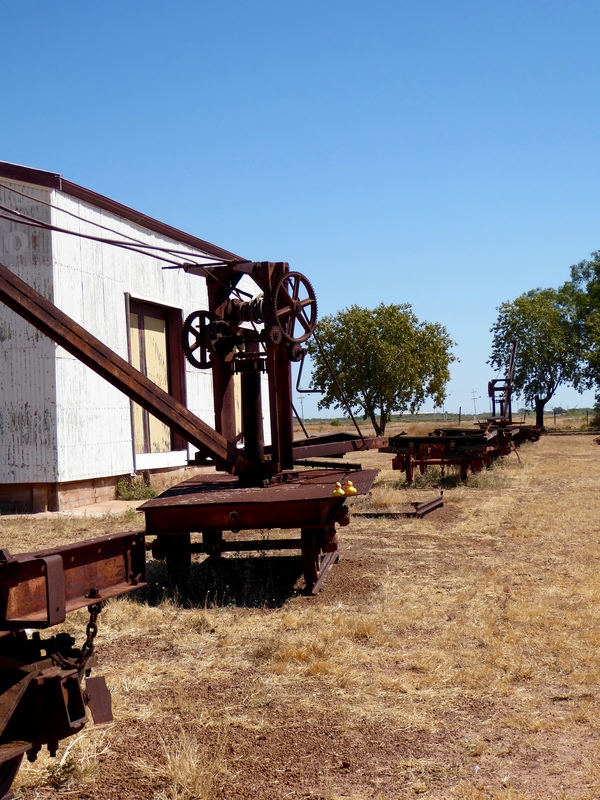 The old equipment from the tramway was real interesting. The tides at the jetty vary greatly. 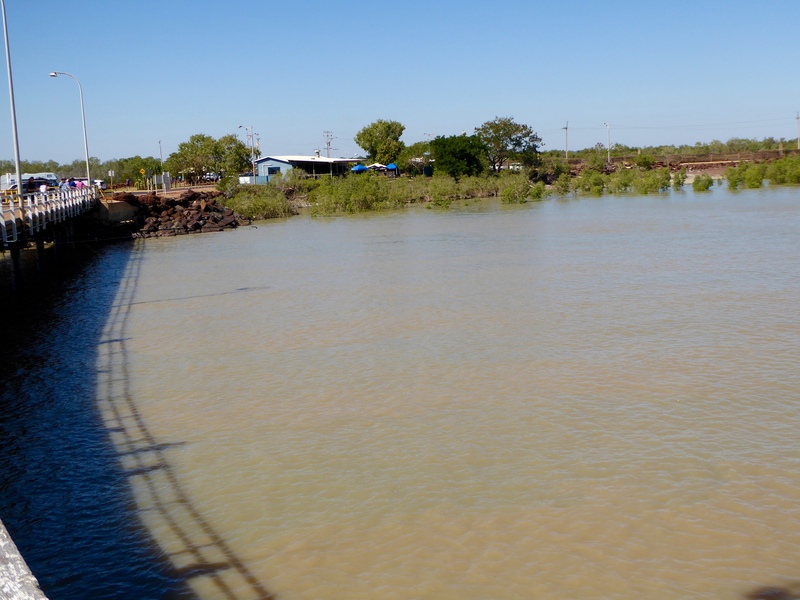 These tides are Australia’s highest, with tidal variations being as much as 11 meters. 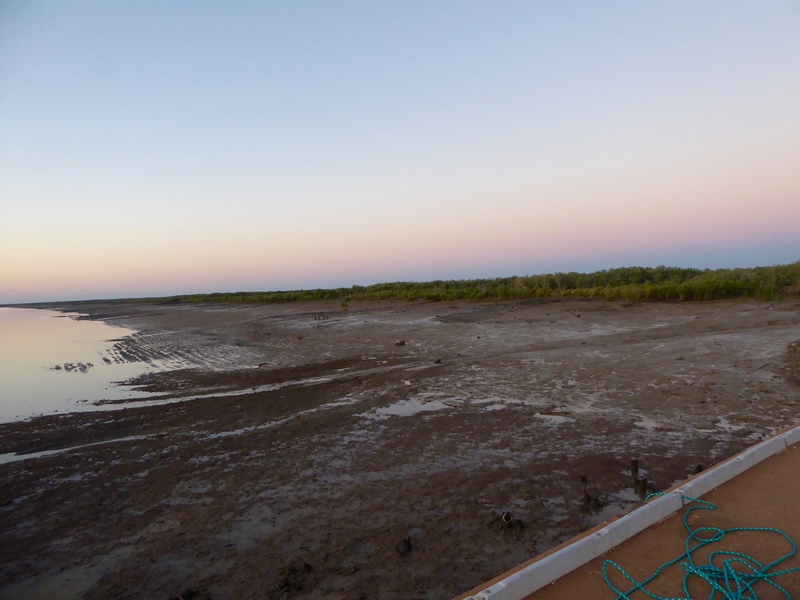 These photos are near low tide. These photos are near high tide. The jetty is also a great place to watch the sunset. We love sunsets! We enjoyed our visit to Derby, Australia. We think you would enjoy Derby also, but go during the winter if you can. Summer brings rain and flooding during The Wet.